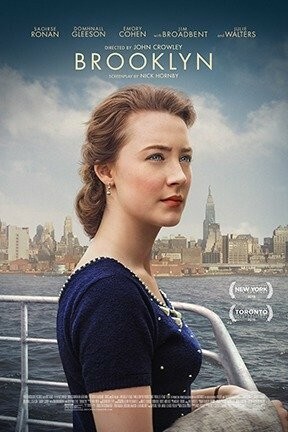 Set in the early 1950s, this immigrant drama follows a young Irishwoman (Saoirse Ronan) as she leaves her mother and sister to settle in the title New York borough, works as a countergirl at a Manhattan department store, and falls in love with a sweet Italian boy (Emory Cohen). After a family tragedy calls her back to Ireland, though, she must choose between her new life and her old one. Director John Crowley (Boy A) and screenwriter Nick Hornby (adapting a novel by Colm Toibin) tell this story with humor and feeling: the heroine's homesickness and separation from her family are powerfully felt, yet there are big laughs in the dinner-table scenes at her Brooklyn boarding house, where she and her lively, romantically inclined housemates clash with their prudish and forbidding Irish landlady. The film is suffused with the sense that a person is just about to bloom. With Domhnall Gleeson, Jim Broadbent, and Julie Walters. Brooklyn is not showing in any theaters in the area.